Image: Masi Losi Acting Director General of GCIS, Phumla Williams giving evidence at the state capture commission of inquiry sitting at Parktown, Johannesburg, on Monda, September 3 2018. 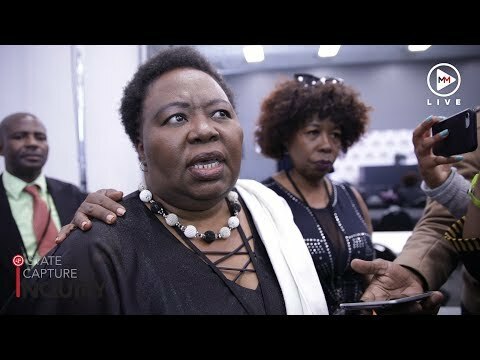 Acting government communications head Phumla Williams broke down as she opened up about months of “torture” at the hands of her former boss‚ Faith Muthambi. During her second day on the witness stand at the State Capture Inquiry‚ Williams painfully relived the emotional and verbal abuse by Muthambi‚ the former communications minister — and told of how she had relied on the support of colleagues and medication to carry her through. Her hope: That the commission will restore the damage caused by state capture that is estimated to have cost the country in excess of R100-billion. Here are some of Williams’ quotes during her testimony that point to a dedicated civil servant who was demoted and stripped of her powers as acting director-general so that others could loot the state. 1. Muthambi demoted Williams in 2016 from acting director-general to deputy director-general and forced her to pay back R35 000 of her salary. Williams testified how Muthambi stripped her of performing important functions‚ which dealt with procurement and finance. “I had panic attacks. I saw torture going through my body again. I never thought in this government people can do such things. I was tortured for weeks [by apartheid government] and Muthambi did the same…She was cheating the state because basically I was being paid because she wanted that procurement [unit] at all cost. She wanted to steal at all cost. It was a ploy to remove finance and procurement away from me. They knew that they had removed me from doing Cabinet work and I was going to be a nuisance and they decided that procurement and the finance must be removed from this woman." Williams informed the commission that she had been captured by the apartheid government in 1988 in Soweto and tortured in Piet Retief. These memories had been sealed in her mind until Muthambi had walked into her life when she became the minister of the Department of Communications which is responsible for GCIS. 3. After giving her evidence‚ Williams briefly spoke to journalists about the horror she had endured. She said Muthambi’s lawyers told her they were sorry for what she had gone through. 4. Williams applied for early retirement “because my health was failing me”. On 5 September 2016‚ she withdrew the early retirement application. “I had to dig deep in my inner soul whether I am doing the right thing or not. I had to dig deep into what made me strong in the tortures that I went through when they wanted me to be an askari. I had to realise that I’m selling my country‚ and letting down my children‚ who look up to me. 5. Williams hopes that the commission will restore the damage caused by state capture. 6. Support has been overwhelming‚ but former president Jacob Zuma’s silence and his protection of Muthambi was painful.